When a bingo site leaves you feeling perplexed or it is too complex, there is a remedy that will cure any type of “plex” you’re experiencing. Bingo Plex is where the fun begins and is very simplex. There is money everywhere at Bingo Plex and not the kind that jingles, cold hard cash that remind us how glorious it is to win! The homepage features a stunning lady in red with her shopping bag bursting with cash. Bingo Plex makes it easy to navigate the site and even allows players to freely roam the lobby without having to register first. That is an indication of confidence on their part and opening up the lobby to visitors is best way to get a true feel for a site. The online bingo shop is a nice alternative for points accumulated in wagers. Instead of just offering a cash conversion on points players will have something to show for it with some pretty amazing gifts including laptops. Byworth Entertainment is premier software and the platform for Bingo Plex. 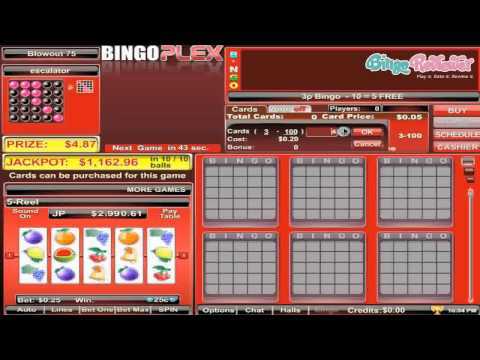 Plex Gaming Ltd. owns Bingo Plex and is also partnered with Bingo Entertainment Ltd. The site is fully licensed and regulated in Netherlands Antilles. Players won’t find a better resource for variations in bingo with every type of bingo offered at Bingo Plex. Whether you’re favorite game is UK’s 90 bingo, American 75 bingo, 80 bingo or 30 ball speed bingo, it is all there for every type of bingo player. You may even discover a new favorite variation along the way. Slots are a bingo players favorite alternative and Bingo Plex offers a variety of slots to choose from including 3,4,and 5 reel machines. Instant games have a bingo theme along with Jingo bingo with Pull Tabs and Keno options too. The Casino has Blackjack and plenty of Video Poker including table Caribbean Stud Poker with Progressive Jackpots. Bingo Plex spoils their players from the moment they sign-up. A free No Deposit Chip is extended to all new players. Once you are prepared to make your first deposit a Deposit Bonus is applicable. All further deposits will procure a Reload Bonus. The promotions dropdown menu has specials for every bingo room complete with schedules and times. Penny Bingo, Guaranteed Jackpot games, Chat Games and some unique games that offer extra free cards or Bingo Bucks. Every month at Bingo Plex the top 10 wagering bingo and slot players for the month will share a prize pool. You can view your current standings throughout the month under the Monthly Tournament tab. Share your joy for Bingo Plex with all your bingo buddies and refer them to come and play. You’ll be glad you did when they make their first required deposit and a percentage of that goes straight to your player’s account. There is a lot of pride in this bingo site and it is well maintained with fresh and innovative promotions. Incorporating every bingo variation is motivational for bingo players. We rate Bingo Plex with 4 Pink Hearts. For the most part, I enjoyed myself at this site! However, I was a little disappointed that they only offer two variations of bingo. I like to see at least three options at any given site and so I wasn’t too impressed with that. They offer the standard 75 and 90 ball games. Don’t get me wrong, I love playing these classics, but it’s always refreshing to mix it up a bit every once in a while. One thing I was impressed with was their jackpots and their exciting promotional offers. I also really like the layout here. The red accents really make things pop! Another thing that could stand to be upgraded a bit is their welcome bonus. They give away a £10 no deposit bonus just for signing up. Now, this isn’t too bad but I have definitely seen better. It’s gone in no time at all and doesn’t really give you all that much of a chance to try out what they have to offer. I know that most of the players like to check out the no deposit bonus offer, and bingo plex awards all the new players with £10 to play with. I know that it doesn't sound like much, but you can buy quite a few bingo tickets, and test out the games to see if they work out for you. New players will get a deposit bonus too, and that's a 350% first deposit bonus and 75% for all the reloads, so not a bad deal actually. The site has a host of Slots, Instant and Casino games, but what made my day is their Bingo offer. There are 10 rooms in total, and they have all you can take bingo! The classics like 75 and 90 ball rooms (four of each) and 80 ball and 30 ball rooms, so you will be covered, no matter what kind of bingo you prefer! Great place!